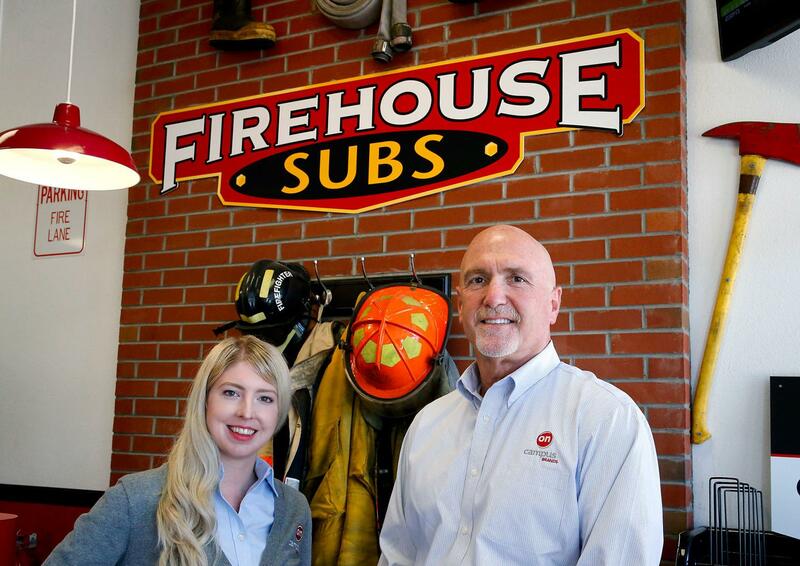 Allison Deerr is director of marketing and operations and Jim Gregory is founder of OnCampus Brands, which has worked with Firehouse Subs to establish a presence at two colleges, with potentially eight more college locations in negotiations. The retail food choices on many college campuses are dominated by a handful of large, national brands. Richmond resident Jim Gregory is trying to change that with his startup company, OnCampus Brands. The budding business connects unique restaurant offerings with universities to give students more food choices. “We feel there is a great opportunity to bring more authentic, higher-quality options to students on campus,” Gregory said. He founded the Richmond-based company in 2016 after working for more than two decades in the nontraditional and co-located retail business, including working for Steak ‘n Shake restaurants to establish locations on college campuses, at airports and other nontraditional retail channels. With his startup, Gregory draws on that deep experience to help clients in the restaurant business navigate the complex world of campus dining, which often involves negotiating with large, contract food-service providers such as Aramark, Compass and Sodexo. Gregory developed a database of more than 700 college campuses, the food options available there, and when new opportunities will become available. OnCampus Brands uses that database to help clients find the best opportunities to get their brands into food courts and other campus dining locations. The company also will help clients make connections and negotiate with contract food-service providers and college administrators. Recently, OnCampus Brands announced its newest client, Star Ginger, which is one of those upstart brands. Founded by celebrity chef and award-winning restaurateur Mai Pham, the chain has more than 20 locations and serves Pan-Asian dishes such as Vietnamese pho, Thai chicken green curry, banh mi sandwiches, stir-fry rice bowls and fresh salads.